When you cook, you can improvise. When you bake, you need a recipe. However, when you want to make a new frosting, you can do a little of both. 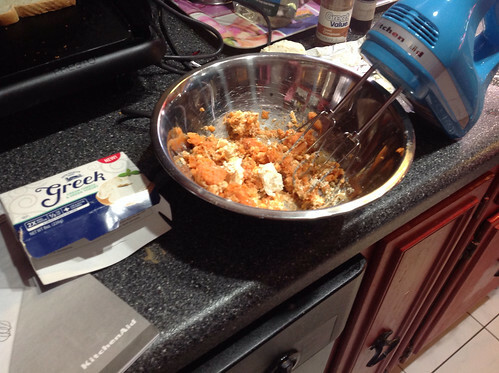 I was inspired to make sweet potato cream cheese frosting after looking in the fridge one morning. There was a baked sweet potato leftover from dinner, and greek cream cheese that was sent to me by Green Mountain Farms. Cut the sweet potato in big chunks and put into mixing bowl. Taste to see if you want add more spice. Add in confectioner's slowly. Add half a cup at a time. Stop to scrape frosting from sides of the bowl. Taste again. If you want to add more spice or sugar, do so. Frost your cupcakes or put in a container to save for later.